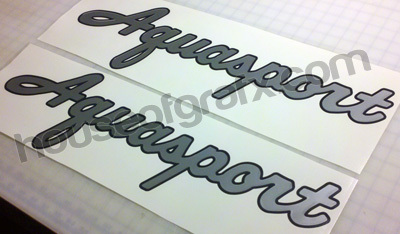 You will receive a pair (2 decals) of Aquasport two color graphics just as shown. Outline will be one color, inside lettering another color. They come with transfer tape, ready to apply. Cut fresh when ordered from professional grade material. Each graphic will measure 7" in height from the top of the A to the bottom of the q and 24" in length. AVAILABLE COLORS TO SELECT FROM Red, Maroon, Orange, Yellow, Apple Green, Forest Green, Kelly Green, Sapphire Blue, Navy blue, Royal Blue, Sky Blue, Purple, Flat White, Gloss white, Flat Black, Gloss black, Gold, Silver, Chrome, Beige, Light Brown, Pink, Copper Metallic. SEE ALL THE ABOVE COLORS BY CLICKING OUR COLOR CHART ON THE RIGHT HAND SIDE.